It adds that it is offering great deals on low rate finance coupled with its innovative technology. 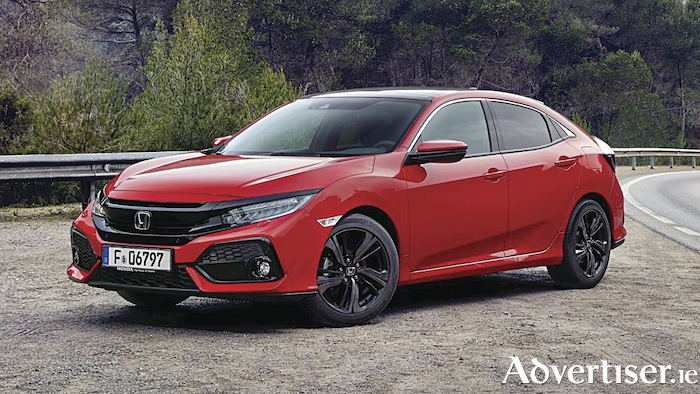 It claims Honda is leading the way when it comes to 182 with a choice of a number of offers on all vehicles ordered before June 30 and registered by July 31. The first offer is 3.9 per cent APR finance available across the range. Another is offering a free service plan on all diesel models. It is also offering complimentary road tax for all Jazz models. The final offer is a choice of one of the following options: complimentary leather upgrade, or €1,000 deal booster, or €4,000 guaranteed minimum trade-in value, or complimentary road tax and service plan, available on all CR-Vs. These offers mean there is a deal now available on every Honda model for 182, including the Continental Irish Compact Car of the Year, Honda Civic, from €23,750 available in both the punchy i-VTEC petrol and the Guinness World Record setting i-DTEC diesel engines all with Honda Sensing as standard. Honda says the overall best-selling SUV in the world, the Honda CR-V, is already a hit with Irish SUV buyers thanks to its award-winning economy and reliability. The Honda Jazz, designed to be small on the outside, yet spacious inside, sets new standards for small car design, while the versatile HR-V, the compact SUV, is packed full of equipment and technology. Speaking at the launch of Honda’s 182 campaign, Honda's sales and marketing director John Saunders says 2018 is an important year for the company as it delivers a full range of refreshed and new cars into showrooms nationwide. The Honda Civic family is now complete with the four-door sedan due to arrive into Ireland in August, followed by the new CR-V, available in both hybrid and petrol engines, at the end of the year. "We are delighted to be offering ‘Powered by Adrenaline’ to our customers making an offer on every vehicle available to them," Saunders says.